Beacon Alpacas, Husthwaite – Review. Victoria makes a furry friend at a York farm. 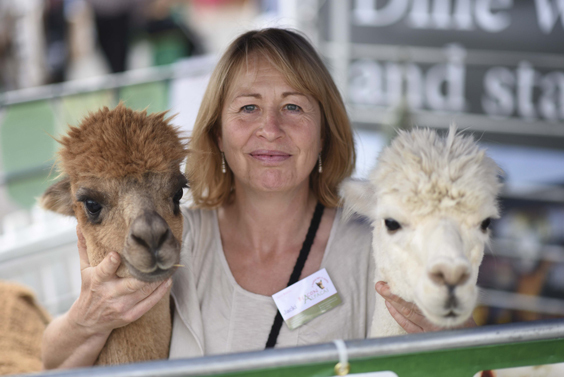 If you are a fan of the television programme The Yorkshire Vet, then you will have probably seen Beacon Alpacas, as they feature on it most weeks. I have always been intrigued by these beautiful, fluffy creatures who produce some of the most amazing wool, which is so much warmer than the usual sheep variety. So taking to the internet, I found the Beacon website, and aside from learning more about these fascinating animals, I also discovered that I could go visit them – and, even better, take them for a trek! I booked a trip with Jacki online, and within no time at all she had got back to me to arrange a date and a time to go to the farm, and to get up close and personal with my new walking companion for that afternoon. On the day, the farm was really easy to find, despite being tucked away on the Malton Road in Husthwaite, North Yorkshire. It was a little overcast when we set off; however, once we got on the road, the sunshine came out, much to everyone’s delight and, I should imagine, the alpaca’s. Upon arrival you will need to go through the large gates at the bottom of the farm track, and drive around up to the house, where there are ample parking spaces. Make sure that you close the gates behind you though, as they do have other animals here. We were greeted by the owner Jacki, who was incredibly welcoming and friendly, and some other walkers who had booked the experience. The groups do not tend to be very large so the animals are not overwhelmed. Jacki went through a health and safety session with us, and explained where we would be trekking and what to expect. So remember to take suitable footwear, as this experience is not like walking a dog round a park. There were lots of alpacas out in the fields, although not all of them are for walking. 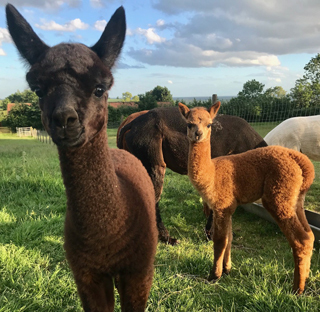 You will see some adorable baby alpacas – or cria, as they are known – out and about playing with and learning from their mums. Jacki explained she had been busy with quite a few new additions since the start of the year, each one as cute as the next. After a short walk through the barn and into the field, we met our group of walkers who have been specially selected by Jacki and her experienced handler, Merrick. We were then paired with our new-found friend for the next hour and a half and I was really looking forward to the experience. Jacki took the lead, and showed everyone how to stand with their alpaca on their halters, and advised on some dos-and-don’ts, and before long we were leading them out into the next field. My companion for the trek was the beautiful Didier, who was an absolute sweetheart, and extremely laid back – I honestly though he was sleep walking. Jacki tells the story of each alpaca, and it seems most of them are prize winners (not to mention TV stars). 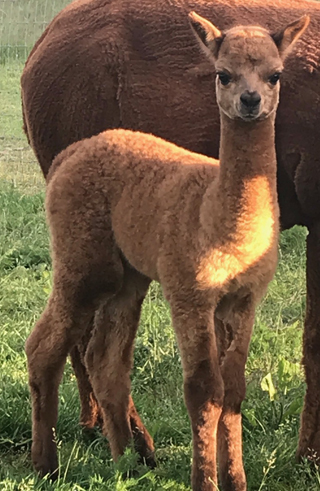 The walk is planned to suit the group, and people with access issues can still enjoy this experience by letting Jacki know in advance so she can tailor the walk accordingly and team you up with the appropriate alpaca buddy. For those with severe walking issues, a trip around the farm can be arranged. The farm is on a gentle slope and you will be walk over grassy tracks and paths. The pace is quite slow, as alpacas like to look around and take in their surroundings. Children 7 to 17-years-old can take part, but must be with an adult to lead an alpaca. To be honest, even with my creaking knees, and stiffening back, the trek was not overly strenuous. There was only one gradual incline up to the top fields. I can imagine that alpaca walking is ideal for those who perhaps do not venture into the countryside too much. It’s also great for returning you back to nature, as you enjoy a leisurely amount of time away from the hustle and bustle of city life. Plus, you get to learn something and make a new friend in the process. The normal walk is just over an hour but you should allow up to two-hours for your experience. Merrick and Jacki will tell you about the alpacas as you walk; where they are from, what they eat, about their fleece and how they are farmed. You will also get a chance to meet other alpacas and take pictures and give them some treats afterwards. The views from Jacki’s farm are stunning, and on a good day you are able to see the White Horse at Kilburn and the Vale of York. Each of the alpacas in the group has their own personalities which really shine through. There are some who like to be a bit cheeky and will have a little trot past the one in front to try and encourage a faster pace. Recently added to the farm is a small bothy for walkers to be able to grab some refreshments and have a rest after the walk, and there was even an ice-cream waiting for us when we arrived back. Plus, there is an opportunity to purchase some alpaca products in the small shop. I would highly recommend an alpaca wool duvet for the winter time. What do you need to bring with you? Just some suitable clothing and footwear, appropriate for the weather upon the day, maybe some sun cream and a hat for summer sun, and waterproofs and wellies for those wetter days. The whole experience was very rewarding, and it was wonderful to try an activity of a different nature that takes you away from the ordinary. The alpacas are so charming and relaxing. In fact they even hum to each other when they communicate – something that made me fell incredibly balanced and in-the-moment. Beacon Alpacas offer organised walks every day except Tuesday’s and Thursdays, at 1:30 pm, and trekking takes place most days. Advance booking is essential. You are also able to adopt an alpaca. The cost is £25 per year and you will receive a certificate with pictures and regular updates on your alpaca’s daily life at the Farm. Your Sat Nav will take you to The Old Lodge which is 100 metres from the farm on the other side of the road heading out of Husthwaite. Address is: Suncliffe Beacon Farm, Malton Street, Husthwaite, YO61 4PD.